I watched a student from the Florida high school give a speech just days after the deadly shooting on February 14, 2018. Her words were measured and clear. Her expression was steely-eyed and strong. She went on, at times wiping a tear from her eye. She didn’t hesitate. I listened, stopped what I was doing, turned my head to the side in awe. She spoke the truth, with verve and courage. She spoke the obvious, shaking in resonance from their traumatic experience. As a grandmother and a young elder, I was moved to stand with her, behind her in support. In this time of great challenge and stress, the young may awake to their place in the world and speak in outrage at what they see. Their awakening occurs as they come of age. As they prepare to take on the mantle of responsibility in the adult realm, they learn to speak. My generation rose up in our time. We stood up, shouted from the rooftops and resonated with each other. We must discover our roles now. As these young people stand up and speak, we must have their backs. It is time to rejoice at their awakening and join them, cheer them on and and stand strong for them and with them. Grandmothers rise. It is time. Grandmothers give strength to the young. We know what it takes. We rejoice in their commitment. In the Iroquois nation some centuries ago, women and men were equal though in different and complementary roles. These people revered nature and knew that the dance of opposites was vital to the balance of things. How like the ancient Chinese who recognized the play of opposites in their medicine illustrated in the yin/yang symbol. From her time with tiny ones and toddlers, grandmother holds the space for the young to grow in reverence and love, play and learn in a safe and nurturing place. Soon enough, the young will be called to take responsibility. In their play they grow strong and resilient. Grandmother illuminates that our society is a tapestry of many. She gives essential safety to the young. We never act or have power alone. This echoes the balance of opposites outlined in ancient China and other civilizations. When the balance is off or taken to extremes the foundation of society crumbles. If there is too much dominance either way, male or female, chaos and destruction reign. Reeling out of control, we lose the balancing quality of the dance of opposites. In Chinese medicine symptoms are signs of distress and imbalance. Address the cause and the symptoms abate. Look at our society right now and observe symptoms. Young men act as warriors, yet they turn their warrior nature on their own people, on children, on law enforcement. The angry face, the angry gesture is destructive rather than protective. The honorable warrior takes such action to protect his people. These actions do the opposite. Power is directed against itself. Destruction comes as a symptom of pain and lack of initiation. Young men are given no responsibility and the pent up energy insists on expression. Corruption at the core feeds disdain and dismissal. In ancient China, medicine was seen as bringing a person back to balance and harmony. Symptoms of any kind are signals of imbalance. The imbalance of centuries of male dominated society bears bitter fruit. In returning to the natural balance between male and female, light and dark, we can gain equilibrium as a society. A part of rebalancing will be to stand behind and with young men. They need initiation into the responsibilities before them as they come of age. Grandmothers can have their backs. They will also need mature and strong men, acting as principled warriors, to empower them in the ways of male responsibility. Strong men have the backs of the women and create balance. They stand aside and allow grandmother wisdom/woman wisdom to shine forth. In this they will illuminate for the young the true power of the man. To have such wisdom is to allow a rebalancing, to shine the light on the grandmothers, to be strong. This dance of opposites is eternal and dynamic, never static. The yin/yang symbol is often pictured as an even circle of half white with a black dot in the middle beside the curving other half which is black with a white dot. This illustrates the forever changing dance of opposites that drives the universe. We are always moving—in time from early morning towards later morning, noon, afternoon and evening. We are always on that spectrum. Nature slowly and steadily moves in cycles around the sun, the seasons of the year into larger circles of the seasons of a life, into patterns of a civilization. To walk along this dynamic, dancing play of opposites is to align with nature and gain flexibility. The Grandmothers stand to attend, protect and honor this dance and remind us to resonate with the cycles. The voices of women are often maligned in our modern era. Disdain pollutes the air. These tendencies merge together over years until people are blinded by a blanket of disdain. The opposite of disdain is reverence. We recall and return to the image of women standing to gaze at us, to see us, and for us to see them. They exude reverence in their easy erectness and dignified demeanor. Iroquois guidelines protected people from the imbalance of men seeking power for power’s sake. Women chose which men would be leaders and the subjects for discussion. The discerning gaze of the women protected the Iroquois from falling out of balance, and men provided strength and clarity of vision to protect the clan from outside dangers. They were warriors in the truest sense, warriors for truth with integrity. We are never freed from responsibility. Even when we are old and slower, even when we can’t jump as high, we are still here for a reason. Living for many years is a blessing. This is a time for grandmothers rising. The world is in turmoil and losing center. 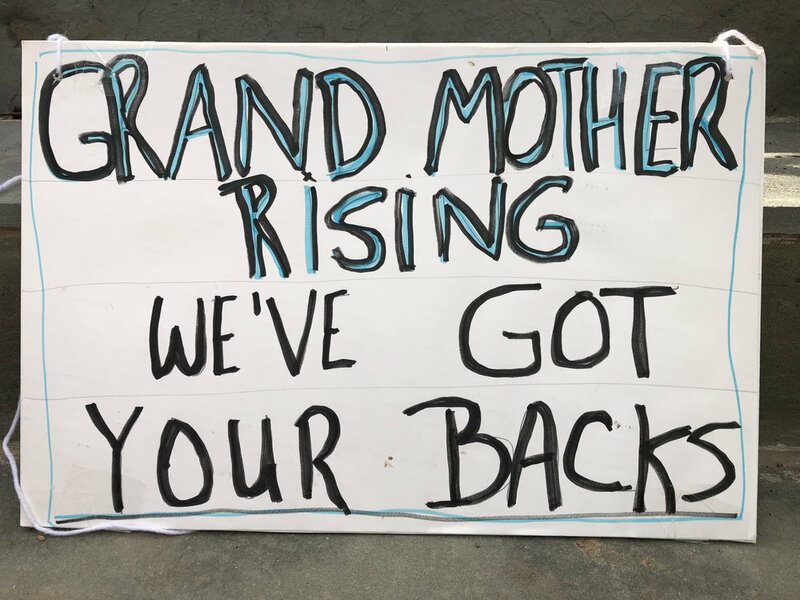 When Grandmothers rise and offer themselves, they resonate with the strong, clear voices of awakening youth. We have their backs.